The first printing (October 2000) and second printing (2001) each contain a number of minor typographical errors, detailed on this page. The html version of the text does not have these errors. If you discover any more errors, either here or in a printed version of the book, then please do mail me so that I can list them here for the benefit of other readers, and perhaps have them fixed in the next printing. We should have included an easy to find reference to the book's web site, http://www.samspublishing.com/title/1578701902 somewhere in the frontmatter. Please replace `momospaced' with `monospaced'. The font used is not Courier, it is some sort of sans-serif. Shell log lines typed by the user are not emboldened. @echo "$@ depends on dummy"
The file `nly.c' should have been listed as one of the C source files. The additional level of `[..]' quotes is necessary to prevent autoconf from doing m4 quote substitution in the sed expression. Notice in the code above, that xcalloc is implemented in terms of xmalloc, since calloc itself is not available in some older C libraries. Also, the bzero function is actually deprecated in favour of memset in modern C libraries -- I'll explain how to take this into account in section 7.2.3, Beginnings of a configure.in. Low level libraries, that is, libraries provided by the host architecture. The kind of library built by Libtool. This encompasses both the shared and static native components of the implementation of the named library. The high level `.la' file produced by Libtool. The `pseudo-library' is not a library in its own right, but is treated as if it were from outside the Libtool interface. A Libtool library which has no shared archive component. 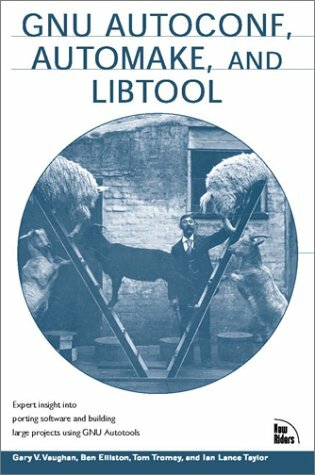 The static component of a Libtool library. (The comma following ``Often'' should be removed). The purpose of this file is to be #included from all the project source files. The Autoconf macro AC_OUTPUT_COMMANDS provides a way to solve this problem. Should have been typeset like the others on the following page (full width, with ``Function'' right justified on the header line. The argv parameter is missing its . sym_prefix should be emboldened, and is a ``Variable'', not a ``Function''. A ``Variable'', not a ``Function''. It is the use of * that causes the problem, not the lack of a directory change. This should be a reference to section 21.2.4, as it refers to the self executing script in that section. Note that the name of the cache variable must contain `_cv_' in order to be saved correctly. as far back as version 2.0 as best as I can tell. AC_EXEEXT is not a Libtool macro, it is an Autoconf macro. Comments on these pages to the webmaster. Copyright (C) 2000, 2006 Gary V. Vaughan.